The necklaces are about 11.5″-12.5″ (29cm-32cm) in length. The necklaces, anklets and bracelets are not for chewing or wearing at night. The necklaces / anklets are suitable to be worn during the day by babies from 3-4 months of age and it is never too late for children to start to wear them. The image above show a range of amber anklets in a wide variety of colours. The anklets/bracelets are 5.5″ – 6″ (14cm-15.5cm). They each have a threaded amber clasp and they are knotted between each bead, for extra safety. They are made from the highest grade of 100% Baltic amber. No two beads or necklaces are exactly alike. The word amber is derived from the old Arabic word “ambar.” The Greek for amber is elektron.Amber is not a mineral or gemstone, but a fossilised sap from prehistoric trees, which grew as long as 50million years ago. All the feedback received from parents has been positive. 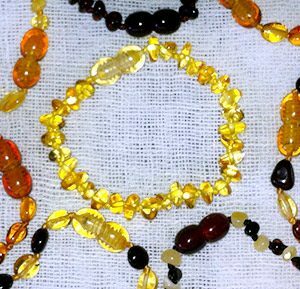 The image below show necklaces which are raw amber. The darker shade is raw sea amber.